I know it’s August, but I really didn’t want July to end. So I’m going to hang on for a little longer as I share some stories from my porch … and wherever else our adventures took us! After we returned home, we went to Holiday World – an amusement park about 2 ½ hours away in Indiana. My friend Abbey told me we only needed 15 people to get a group discount (which is everyone paying the kids’ price!) so we gathered some others and enjoyed the day on roller coasters and spinning rides. My part of the group opted not to go to the water park and enjoyed some super short lines to ride the rides. Rachel was free, but at 36 inches she was able to ride more than expected. Summer adventures have included staying home too. Several local friends have come to hang out on our porch and in our pool, and my dear Sarah and her kids also came for a few days. I ended up seeing her a second time when we were passing through Louisville on our way home from New York. Likewise, earlier in the week on our way to New York, we met up with a couple friends. Seeing people I love is definitely one of my favorite parts of traveling (and adventuring at home!). I’m glad Greg also likes to incorporate visits with friends along our way. Camera card cord for my iPhone – I take a lot of pictures in the summer with my waterproof camera (which I also recommend!) and now I can transfer those pictures directly to my iPhone with this nifty little cord. I store all my photos on the iCloud, so having them on my phone is the easiest way to get them all to the same place. Before this cord I was uploading the pictures from the SD card onto my laptop and then emailing them to myself so I could post onto Instagram and save in the iCloud. This cuts out that whole step. My husband is probably going to want to use it for his trail cam pictures, so I may share it! Pickles to Penguins – This was an impulse purchase from zulily a while ago, but we really love games and this is one we can play with our two oldest kids. It’s quick and easy but fun. Magazines – I have a degree in journalism, so the fact I like magazines isn’t a surprise but with all the books and electronics I had forgotten. I recently subscribed to “Southern Living” and remembered why I love magazines. (Plus I wanted to read Rick Bragg’s column regularly!) I also picked up a couple to read when we traveled. “The Magnolia Journal” is also lovely. “Beartown” by Fredrick Backman – It’s going down as one of my favorites this year. The writing and characters are excellent and real. There is intriguing foreshadowing. And the story provokes thoughts on life. It had a “Friday Night Lights” feel from the beginning. “All the Missing Girls” by Megan Miranda – The story was intriguing and kept me reading this one. I needed to know what happened, even though I thought some of it was silly. “Winter Garden” by Kristin Hannah – This one surprised me. After I read the synopsis, I didn’t know if I would care about it. But I loved it. Not as much as “The Great Alone” or “The Nightingale” (or even “Firefly Lane” probably), but I still highly recommend it. “The Things We Do For Love” by Kristin Hannah – This one isn’t as good as “The Great Alone” or “Nightingale” either, but I’m still really enjoying the storyline and characters. Cate started the Harry Potter series. She read the first book in two days and is now on the fourth. We bought a couple books at a used book sale, she borrowed one from a friend, and then we discovered they’re also on Kindle Unlimited. This week she began the fifth one. I was happy to see the eighth season of Hawaii 5-0 on Netflix. I’ve only watched one episode so far, but I’ll catch up with the crew soon. Greg and I are still making our way through “Suits,” which we’re loving as we begin season three! and stories do you have to share? I guess I’m going to have to check out Kristin Hannah’s books. I can’t even count how many references I’ve run into lately. And I’m smiling, because Hawaii 5-0 is one of our family’s crazy excuses to sit in the family room together eating popcorn (or ice cream). I don’t think season 8 was as good as other seasons. It takes time to bond with new characters, and there was a strange blip in the ending . . .
Kristin Hannah is one of my favorites, obviously. I love that about Hawaii 5-0 being your family’s show. Glad to share the porch with you today, Michele! Sounds like a busy but very fun summer! That’s an accurate assessment. 🙂 Thanks for being here, Barbara! I still love magazines too, although the only one I get now is Time. And I basically only read it when I’m on a trip. ha. They’re piling up now so I need to read them at home as well. 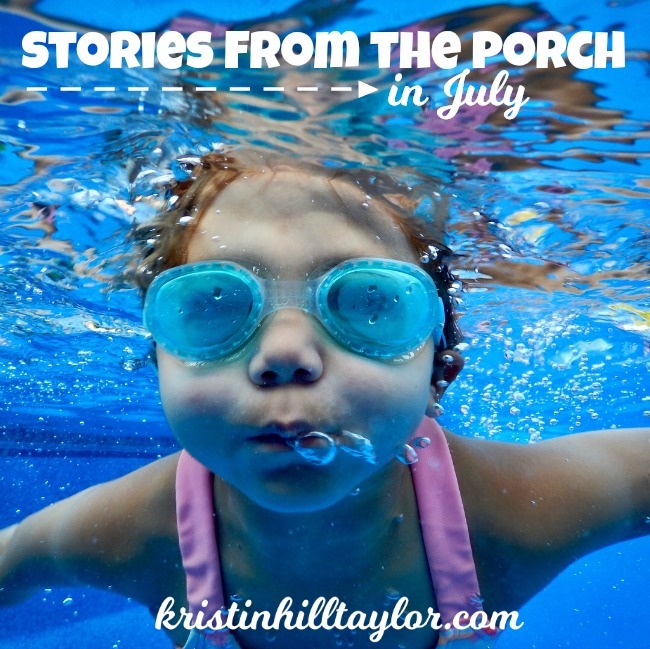 Thanks for sharing this fun list of your summer, Kristin! Thanks for being here, Lisa! I hope you get some time to catch up on those magazines.